Betty Press is currently an Adjunct Professor of Photography at University of Southern Mississippi, in Hattiesburg. Previous to that she taught at Stetson University, Deland, Florida. She is best known for her photographs taken in Africa when she lived and worked in Kenya as a freelance photojournalist from 1987 to 1995. At that time she worked closely with her husband who was a correspondent with The Christian Science Monitor. Now living in Hattiesburg, Mississippi she photographs in the South as well as continues to travel to Mexico, Central America, the Caribbean, Cuba and Africa. In 2008-09 she photographed in Sierra Leone while accompanying her husband Dr. Bob Press who was a Fulbright Scholar and Lecturer at Fourah Bay College. Her photographs have been published in most major magazines and newspapers. 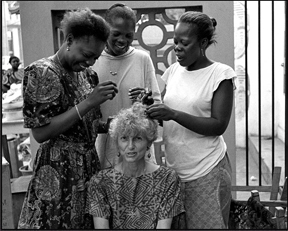 She had the honor to photograph Audrey Hepburn on her visit to Somalia as a UNICEF Goodwill Ambassador in 1992 and Harry Belafonte in Rwanda in 1994. In 1999 her photographs were featured in a book titled The New Africa: Dispatches from a Changing Continent, published by the University Press of Florida. Betty Press studied photography at the University Of Michigan School Of Art, Ann Arbor. Her work is in several public art collections, including the Harry Ransom Center for the Humanities, Austin, Texas, Southeast Museum of Photography, Daytona Beach, Florida, National Museum of Women in the Arts, Washington, DC, Global Collection of Photography, Jamestown Community College, Jamestown, New York. She also has photographs in many private collections. She is represented by Panos Pictures, London; Photographic Image Group, Portland, Oregon; International Visions Gallery, Washington, DC; and One Off Contemporary Art Gallery, Nairobi, Kenya. For exhibition information please contact Betty at bettypress@gmail.com, or view her website: bettypress.com.